1.Morphological Process Is Defined As a Process by Which on Morpheme Is Combined With Other in Order to Make Morphological Construction. 1 1.Morphological Process Is Defined As a Process by Which on Morpheme Is Combined With Other in Order to Make Morphological Construction. 2 The Morphological Process of English Words Are: a. Affixation, is morphological process that takes place by adding affix (es) to the stem, e.g. Disagreement, books. a. Affixation, is morphological process that takes place by adding affix (es) to the stem, e.g. Disagreement, books. b. Reduplication, is morphological process that take place by the repetation of the base, e.g. sayur-mayur, tetangga, zig-zag. b. Reduplication, is morphological process that take place by the repetation of the base, e.g. sayur-mayur, tetangga, zig-zag. c. Internal change or vowel change, is morphological process that take place by change of the sound inside stem, e.g. winwon run ran c. Internal change or vowel change, is morphological process that take place by change of the sound inside stem, e.g. winwon run ran d. Supletion, is morphological process that take place by the total change of the stem, d. Supletion, is morphological process that take place by the total change of the stem, e.g. Go -------------- went e.g. Go -------------- went good --------------- better, etc e. Zero allomorph, is morphological process that take place by seemingly no change of the form, e.g. cost, let, shut, etc. e. Zero allomorph, is morphological process that take place by seemingly no change of the form, e.g. cost, let, shut, etc. 3 2. 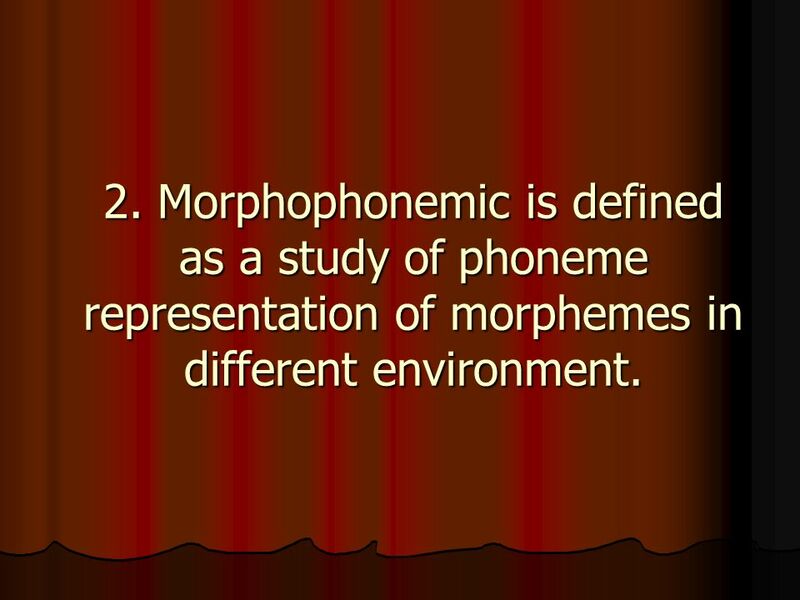 Morphophonemic is defined as a study of phoneme representation of morphemes in different environment. 5 3. 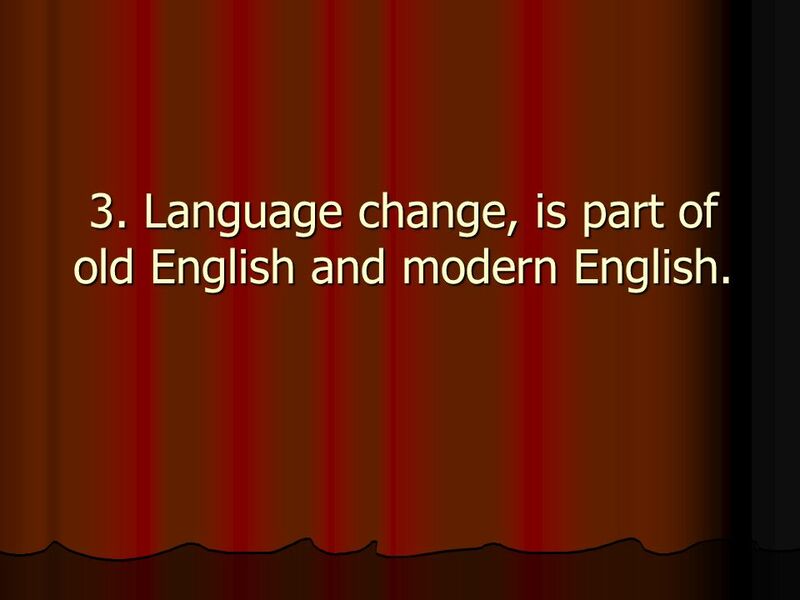 Language change, is part of old English and modern English. 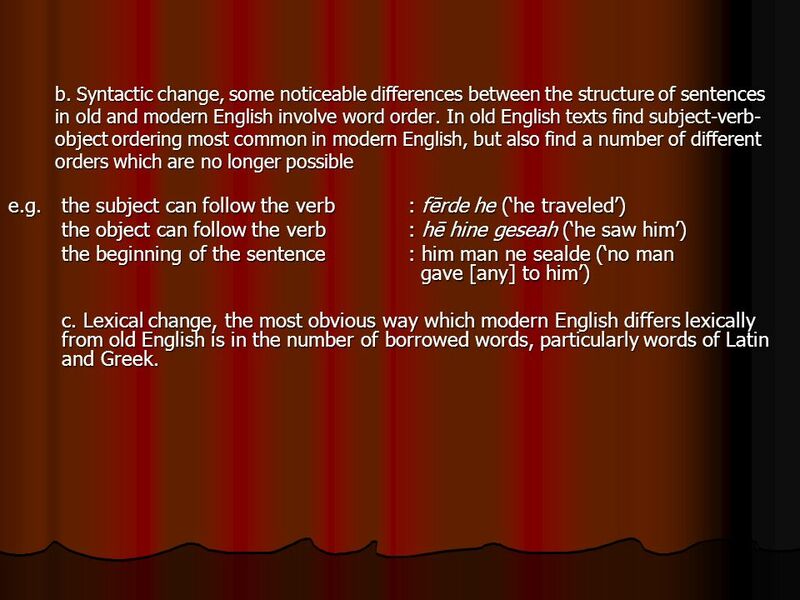 6 Language change, divide into : Sound change, one of the most obvious differences between modern English and English spoken in earlier periods is in the quality of the vowel sound. 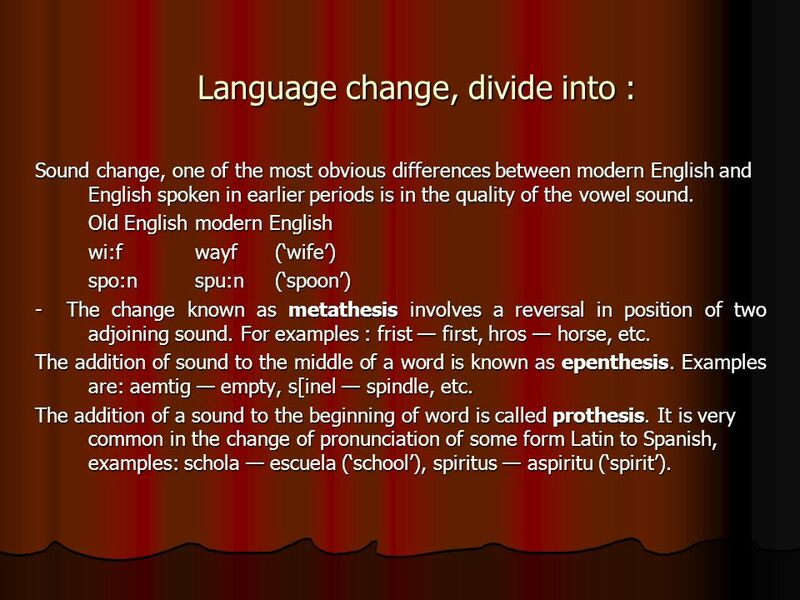 Old English modern English wi:fwayf(wife) spo:nspu:n(spoon) - The change known as metathesis involves a reversal in position of two adjoining sound. For examples : frist first, hros horse, etc. The addition of sound to the middle of a word is known as epenthesis. Examples are: aemtig empty, s[inel spindle, etc. The addition of a sound to the beginning of word is called prothesis. It is very common in the change of pronunciation of some form Latin to Spanish, examples: schola escuela (school), spiritus aspiritu (spirit). 8 - Broadening of meaning is the change from holi day as a religious feast to the very general break from work holiday. The modern use of the word dog, use it very generally, to refer to all breeds, but its older form (old English docga), it was only used for one particular breed. Broadening is the change process of meaning word into general meaning. 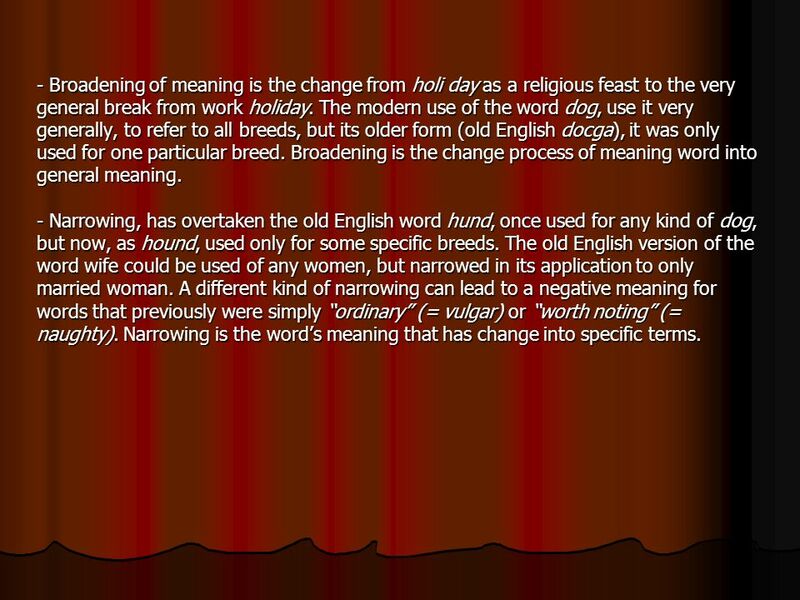 - Narrowing, has overtaken the old English word hund, once used for any kind of dog, but now, as hound, used only for some specific breeds. The old English version of the word wife could be used of any women, but narrowed in its application to only married woman. A different kind of narrowing can lead to a negative meaning for words that previously were simply ordinary (= vulgar) or worth noting (= naughty). Narrowing is the words meaning that has change into specific terms. 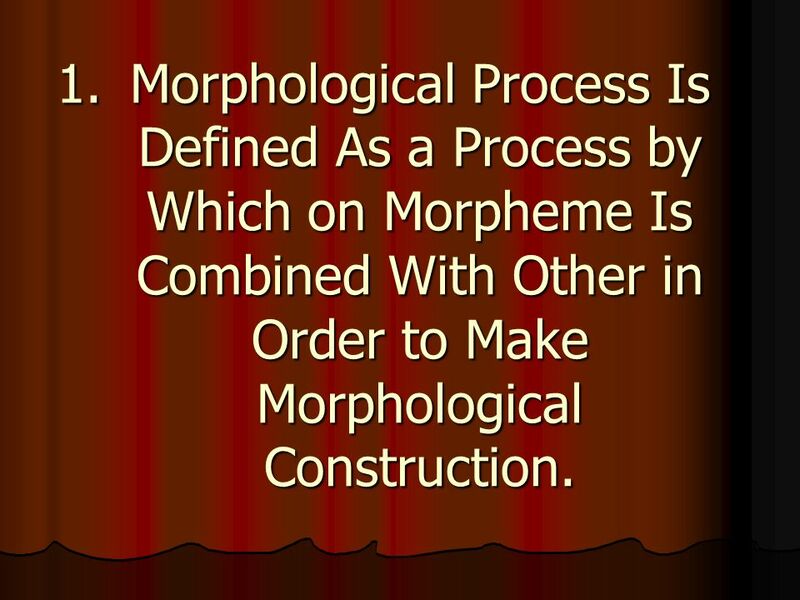 Download ppt "1.Morphological Process Is Defined As a Process by Which on Morpheme Is Combined With Other in Order to Make Morphological Construction." 323 Notes on Phonemic Theory in Terms of Set Theory 1. Notes on Phonemic Theory Here I will discuss phonemic theory in terms of set theory. A phoneme is. The Study Of Language Unit 7 Presentation By: Elham Niakan Zahra Ghana’at Pisheh. Unit 5 Finite Verbs or Verb Phrases. What is a verb phrase? A verb phrase is a phrase whose nucleus is a verb which can be a finite V/VP or a non-finite. Language history and change. Introduction O In 1786 Sir William Jones suggested that a number of languages from very different geographical areas must. Chapter 9 Allomorphy: Books with more than one cover Morphology Lane 333. Ignacio Ulloa.  Different languages from different places must have a common ancestor. Morphology Words and Rules. Lexicon collection of the meaningful sound and their meanings in a language dictionaries attempt to be written versions of. Chapter 6 Identifying Grammatical Morphemes Morphology Lane 333. 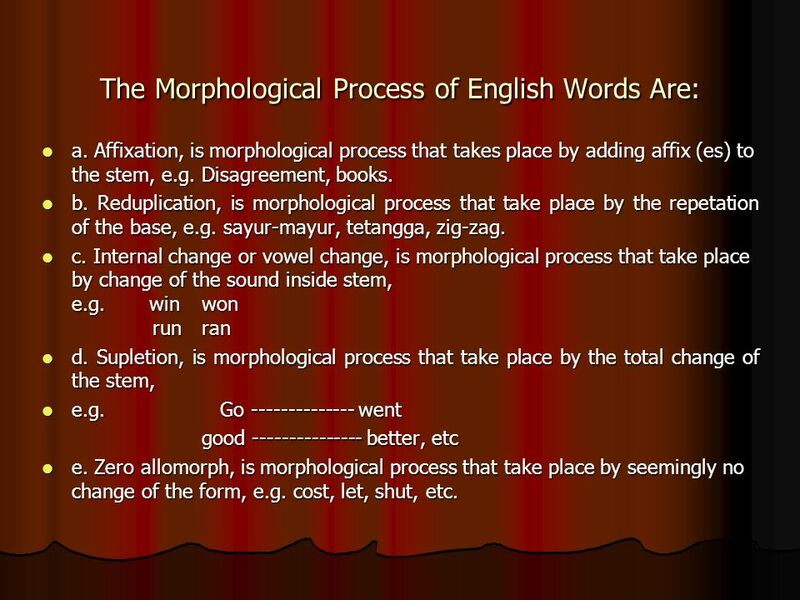 Morphology How to build words. What is a morpheme? 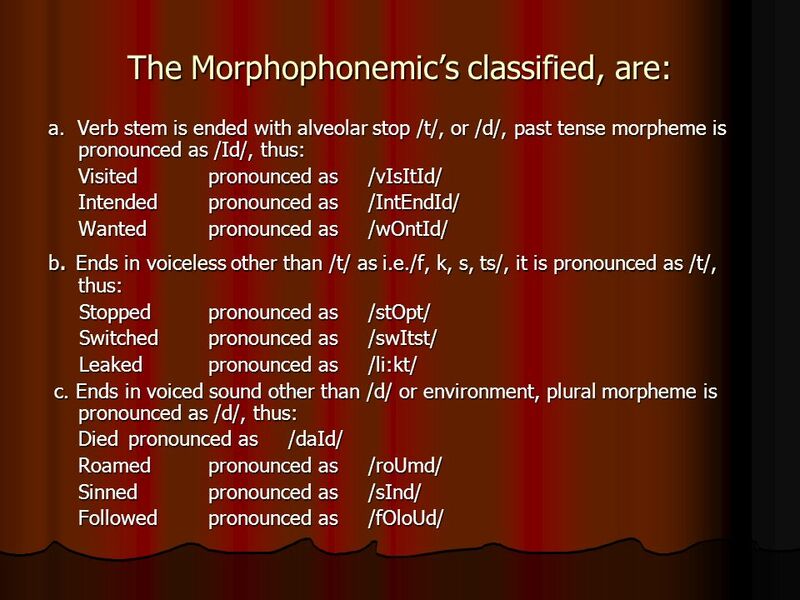 Morphology is the organization of morphemes into words. –The morpheme is the smallest meaningful (invested. Linguisitics Levels of description. Speech and language Language as communication Speech vs. text –Speech primary –Text is derived –Text is not “written.